Bake potatoes 1 hour in a 400 degree F (200 degree C) oven. Scoop out the inside of the potatoes and set aside. Reserve the skins for another recipe or discard. Melt the butter in a large skillet over medium low heat. Stir in the flour to make a roux. Cook about 1 minute, stirring constantly. Gradually pour in the milk while stirring until all the milk has been added. Bring heat to medium and keep stirring until the soup mixture starts to get thick. Add the potatoes, green onions, salt, ground black pepper, bacon and cheese. Stir well and continue to heat for about 15 minutes, allowing the flavors to blend. Stirring well, mix in the sour cream until well blended with the soup. Serve immediately. 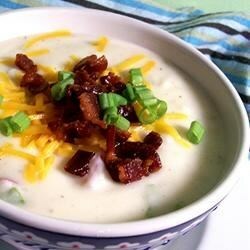 See how to make a rich, creamy baked potato soup. I really didn't care for this recipe. There was no mention of spices of any kind so the soup was rather bland.